In this episode, Dr. Hackie Reitman talks again with Marcie Ciampi, author, educator, and community manager/lead job recruiter at ULTRA Testing. (18 minutes) Marcie works at ULTRA Testing, a software testing company that places special emphasis on hiring individuals on the autism spectrum who are exceptionally suited for finding flaws in websites, mobile apps, and more. In addition to her work at ULTRA Testing, Marcie is also a vocational coach, a peer mentor, business consultant, speaker, and founder of My Spectrum Suite, a Neurodiversity consulting site. Under the pen name “Samantha Craft”, Marcie is the author of the book “Everyday Aspergers: A Journey on the Autism Spectrum”, as well as a contributing author to the book “Spectrum Women: Walking to the Beat of Autism”. 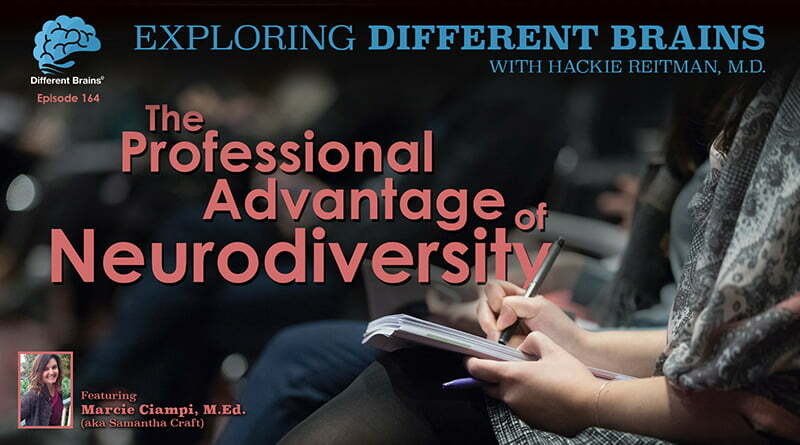 Join Hackie and Marcie as they discuss the business advantages of hiring individuals on the spectrum, ULTRA Testing’s culture of inclusivity, and the importance of supporting co-occurring challenges. HACKIE REITMAN, M.D. (HR): Hi, I’m Dr. Hackie Reitman, welcome to another episode of Exploring Different Brains. Today, we’re so lucky to have returning with us for another episode, Marcie Ciampi, who writes under the name of Samantha Craft- she does so many different things among them, Ultra testing, and you can see her on my myspectrumsuite.com, and Marcie welcome again to another episode of Exploring Different Brains. MARCIE CIAMPI, M.Ed. (MC): Thank you. Appreciate the opportunity to be here with you this morning and all of your efforts and everything that you’re doing to create a more supportive community for those on the Autism Spectrum, and those with neurodiverse brains. HR: Let’s jump over now to Ultra Testing. Tell us about Ultra Testing. MC: I love talking about Ultra Testing because I talk about it so much- it’s really easy for me to talk about. It was started- I love their mission, our mission is that neurodiversity is a competitive it – a competitive advantage in the workplace and it was started, founded around 2013 by two graduates from MIT, it’s based out of New York, and when I first started five years ago, or 4 years ago, we had 5 software testers, and now we have- we’re approaching over 40; we hire individuals across the United States to work from home as software testers. So they work remotely, they are not independent contractors- actual employees, and they have opportunities to move up in the tiers and even become managers. We practice inclusion practices and on-boarding and interviewing/screening processes, everything’s inclusive, and the interview process and screening process, and part of the on-boarding process was largely influenced and designed by me, so we have- I am a neurodivert- neurodivergent manager and I really admire that about Ultra- there’s not a lot of companies that are embracing neurodiversity, that actually have somebody whose the main door threshold, you know, overseeing the main threshold who understands what it’s like to be on the spectrum and being neurodivergent. I can talk a lot about Ultra with you but is there anything specific you would like to know? 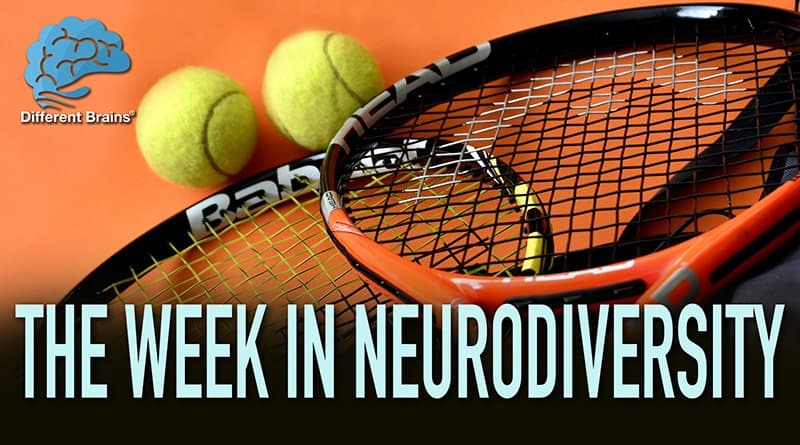 HR: How did Ultra come about to decide to utilize the neurodiverse workforce? MC: One, there were a couple different reasons. I’ll share one with you, is one of the founders, Rijesh, his wife works in the mental health field and she works with or she’d worked with some people that were on the Spectrum, and she actually spoke with him one day about how you know there’s this lack of opportunity for those on the Spectrum, for jobs and that was one of the -one of the things that sparked the idea; there were other reasons, but for the main reason is that they both, the founders, saw all neurodiversity and autism as a competitive advantage, as far as innovative thinking and creative contributions, and we’re showing that we’re succeeding, you know, where in what- year five, continuing to grow, we’re going to have our biggest year growing. Testers this year, we’re probably going to be hiring another 20 to 25 testers this year alone. MC: We’ve got some big clients, big names, that people would recognize, and we’re continuing to create initiatives that are very unique and not seen in other places. We started with our on-boarding now just recently to include a three-hour diversity inclusion program that I put together based on probably over 2,000 hours of research into the topic of autism and how it relates to employment, and so we start off with teaching our new testers about diversity inclusion, and what is that mean, and what does that encompass and how can we all be included, and then from there they are invited to attend to our workshop on reducing stress and anxiety in the workplace. So we’re really- we’re really embracing this inclusivity and with the aspect of supporting individuals not just- not that – just the diversity part of the inclusion part what does inclusion look like and what can we do to make a -foster a workplace that’s inclusive for them. HR: And as Jose Velasco, the global leader for SAP told me, we were on a panel together, and he said, “Hackie, this is not a social welfare problem; this is not a social welfare movement; this improves our bottom-line, this is a changing business. MC: Exactly, exactly, and everything we do is universal practices. So I don’t believe in siloing; here is the autistics, you need to learn about what autistics are- no. It’s like, here we are as human beings; here’s how we are all diverse; here all our challenges and here are all our strengths; and we’re community, it’s not about highlighting how one individual is better or less than, and that’s a pitfall that some companies kind of fall into, so we talked a lot about the difference between what is diversity, and what is inclusion, and in many organizations, they’re really into the diversity part. The number of differences amongst the individuals, but they’re not considering after the fact, once individuals are hired, the inclusion part which is the manner in which those individuals are respected, valued, and supported; long-term measures that are universal across-the-board; not three months with a job coach, and then you’re on your own. We’re talking about procedures, processes, handbooks, workshops, we do surveys everyday, we do once a week surveys, we do yearly surveys, we have a community gatherings where we voice what’s working, what’s not. I am a service community manager, people can talk to me anytime about needing workplace adjustments, workplace accommodations, about their anxiety, about their afraid to approach their supervisor how did they approach them, so we have put in that support; it’s there and then we continually work for ways to show how they are valued and respected as employees and- and we’re not afraid to hear the truth, and to listen to feedback, and then make a move on that, what can we do to help you all here. HR: What would you say to an employer who doesn’t think that they can hire someone on the spectrum because the jobs they have don’t involve technology? MC: (Chuckles) That’s such a great question! I surveyed over 180 autistics about two years ago, around the world, and there were only a few that were in the tech industry; the rest were- a lot of teachers. Teachers’ aides, people who worked with animals, authors, a lot of artists, gardeners, doctors, lawyers; it’s like saying human beings are only good at technology, when you say an autistic is only good at technology; well that’s ridiculous, if you look around the world we’re not all on the tech field. Autistics are just a pedal on the flower of humanity, we’re just one pedal, and we have all the same feelings, strengths, challenges in life that a lot of people, and we have a lot of the same interests and varied minds, and experiences that bring us into those interests as anybody else, so I would say that, yeah that’s the media, that’s a stereotype, and hopefully that will be moving away from that, and if you can look at it as individuals, and not as a stereotype, that’s a huge first step. MC: It hurts to say someone working at a carwash isn’t doing a beautiful- making a beautiful contribution to the world- I mean some of the people that I’ve had the most insightful connections with, are in the service industry. I mean you can work a service job, and the attitude that you carry with you, and- and the smile, and just being who you are can brighten someone’s day and then that has a rippling effect, I mean service industry does great in this world, so who’s to say that one is better than the other. You know? Someone could be working at the carwash and working on the novel at the same time. You never know what they’re doing and maybe they want to work at a carwash, so that they don’t have the stress of a fifty hour a week job and they’re actually enjoying life, and so I would just say that’s very judgemental, and narrow-minded. HR: Yeah. I wanted to ask you particularly about one thing which I found is speaking around the country and meeting different people and all; whether it’s the Down Syndrome Community, or the Alzheimer’s Community, or the psychology community, is the great importance of socialization, and strong social relationships. Would you care to comment on that from your point of view? HR:– well I get concerned, for instance, on remote workers is an example. MC: Oh, okay! yeah, so what we do at Ultra to help with that aspect, is we have- we meet online, and they have -we have networking groups through slack that have different interests, like technology and reading, and I even created when we know what you do this weekend and we have gatherings face-to-face gatherings, where we can interact and see each other and actually, what we’re working on with this next gathering, is how can we build more socialization and more engagement in the community, and so were using those gatherings to brainstorm, can we do once a week video gaming on Fridays, after hours, and should we have more meetings during the week with that are just- you know to just join us and chat, bring your lunch, face-to-face- so this is definitely an aspect that is important in the workplace, especially for remote workers. Something we take very seriously and it’s hard, I mean I was talking to a gentleman yesterday, and for me and my son, sometimes the hardest part being on the spectrum is just getting outside the door; all the cognitive processing and sensory, everything that has to go on just a shower, get dressed, you know put on my makeup, what shoes I’m going to wear, and then how is it going to be once I get outside that door. So what I try to do is once I get outside that door. I don’t just do one thing, I try to do three or four things, ‘cause I’m out there and you know, there’s a good chance I might have to rest the next day, so finding unique ways that work for using individual to socialize and so for me it’s like yeah I got to get out of that door and then I’ll be okay- it’s an essential aspect; it’s very unhealthy for children or adults to be sitting in a dark room you know, 12-13 hours a day, or a dimly lit basement, and not getting out into nature and the sunshine, and other people, and we’ve learned so much that we’re you know, we’re not that different and we’re not alone when we’re around other people. HR: Marcie, is there anything we have not covered that you would like to cover? MC: I’d say that- well I did want to mention that if you would like if there’s someone you know that is neurodivergent, and of course we’re an equal-opportunity employee-employer, so anyone can apply but particularly neurodivergents, we are hiring at Ultra Testing; you can contact me at -there’s links on my website and then also you can contact me at marcelle@ultratesting.us; you can go to ultratesting.us and learn more information and -and message us from there, and I would also like to say that it would -for me, personally, I hope that businesses in general can really start focusing more on what happens after the first individuals come through the door, that it’s not just about Autism hiring initiatives, it really -the primary focus needs to be on that inclusion, what happens after people are through the door. I’ve heard stories of people getting severely depressed, quitting, being fired, and even suicide; more than once from autism initiatives where they’re hiring them, but not providing the supports they need afterward, and so my plea would be for these organizations that are really tooting their horns about these hiring initiatives to take some real attention to those inclusion efforts, and it’s not just about a job coach. It’s about this universal approach to include everyone in the workplace and acknowledge that they are valued and respected, and offer those supports that they need, and we’re not just numbers, and we’re not just a way to get the bottom line. We’re people, with real experiences, and many of us with co-existing conditions that need attention- such as generalized Anxiety Disorder and Mood Disorders. HR: And that- that’s kind of a segue into how none of this stuff, occurs in isolation; there’s always comorbidities, there’s always high- you can’t have one without others and so on and so forth. MC: and it’s not just neurodivergent people. I mean there are new studies out of Cornell, that twenty- more than 24% of, I think it was three thousand employees interviewed, stated they have a disability at work. So we’re- we’re talking about a quarter of the population that is now openly admitting that they have a disability in the workplace and that doesn’t count people who have had other life challenges such as death of a loved one, or divorce, or other types of trauma or look at chronic illness. I mean it’s rampant. Chronic pain, so we have so many things I meet- almost everyone I know, nowadays, has some type of suffering or challenge that they’re carrying. It’s almost part of being a human being, I mean, for my philosophy, is it is part of being a human being, so let’s acknowledge that, and let’s work together to support each other and focus on creating a solution- not division. HR: And let’s help each other with a smile too! HR: (chuckles) well Marcie, thanks so much for coming back to differentbrains.org, we love having you here, can you tell our audience who would like to get in touch with you, where they can learn more about you? MC: Yes and thank you! you can find out more about me and the Autism Spectrum at my website myspectrumsuite.com, suite as in an office space, SUITE, myspectrumsuite.com, you can find out more about the company that I work for at Ultra Testing at ultratesting.us and both of those sites will provide you an email for direct contact. HR: Marcie Ciampi, thank you so much for returning again, and we hope you come back yet again to Exploring Different Brains! 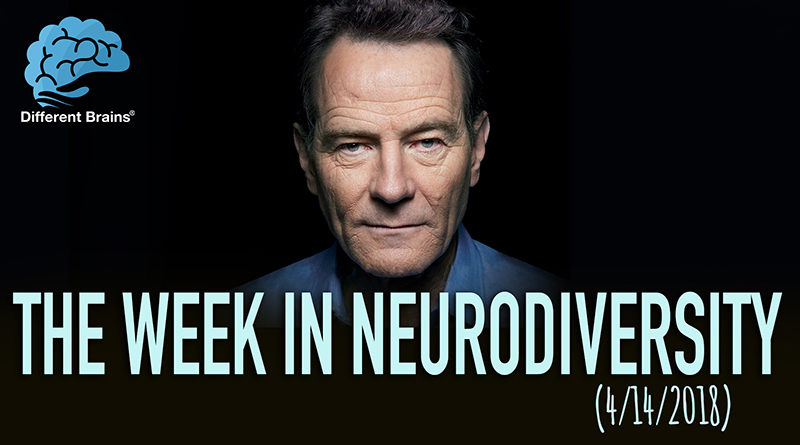 We’re so lucky to have you as one of the champions in the neurodiversity community. 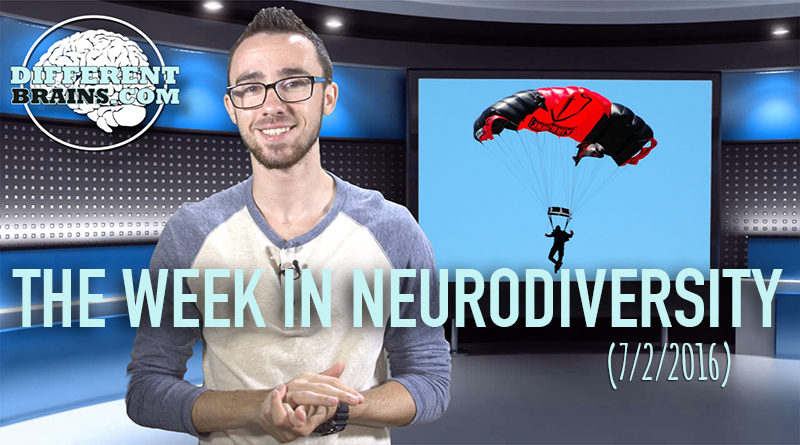 In this episode, a man sings to his mother to help with her Alzheimer’s, a girl with Tourette’s graduates high school with her service dog, and how many times did a man skydive in 12 hours to raise money for Parkinson’s research? (3 mins 27 sec) In this episode a 14-year old model with Down syndrome rocks Denver runways, Bryan Cranston’s advocates for Alzheimer’s awareness, and more!